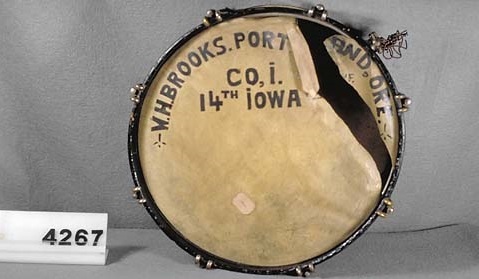 Drum played at the funeral of Abraham Lincoln by W. H. Brooks, a resident of Portland, OR and Hillsboro, OR after 1908. Brooks enlisted in the Union army in 1861 when he was 14 years old and served in the 14th Iowa Regiment in a brigade the Confederates dubbed the "Hornets' Nest" because it so fiercely defended its position in a sunken road at Shiloh, Tennessee. In 1931, Brooks told an Oregonian reporter he had marched more than 800 miles before his discharge from the army. He recounted, "I was in the consolidated drum corps that played in the funeral procession of President Lincoln from the city to Oak Ridge cemetery in May 1865. I saw the president's casket placed in the vault."